Looking for love drives this Canadian dentist, Sandy Crocker back to Ireland. What would you do for love? Would you put your life on hold for a month and travel more than 4,000 miles to find a girl whose name you don’t know, who you spoke to for two minutes? That's what this Canadian dentist is doing. Here's his story. B.C. dentist Dr. Sandy Crocker has taken the phrase "follow your heart" to a whole new level. 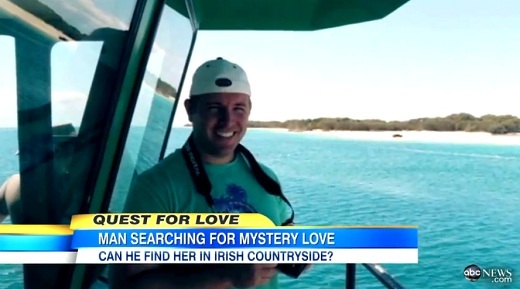 The 34-year-old, originally from Prince Edward Island, has given himself four weeks to try to find a young Irish woman he bumped into at a café in the Irish countryside while on vacation last year. “[She] was one of those people that I felt just wore their inside on the outside. When you looked at them you instantaneously knew that they were a good person without question,” the Kelowna dentist told “Good Morning America” Saturday morning from Belfast, Ireland, ABC News reports. But there's a small problem: He doesn’t know her name or where she lives. Crocker was in "An Teach Bia" café in the tiny west coast town of Ennistymon, County Clare on July 9, 2011, when he made brief eye contact with a "striking" woman in her mid to late twenties with reddish brown hair and freckles sitting a few tables away from where he and his brother sat. At the time, he was too afraid to ask for her phone number. It's understandable, under the circumstances. His "breath was taken away to the point of near suffocation" when he first laid his eyes on her, according to the National Post. But he did find a way to speak to her. Good luck, Sandy and with the social media world today, I bet you find her.